Hi friends! I hope you had a good weekend! Anton spent quite a bit of time crafting and painting with me and I have a project of his to share tomorrow. He particularly enjoys using my Dina Wakley Scribble Sticks at the moment, since he can get a lot of color down quickly and turn it into watercolor if he wants to. Deco Tape is another current favourite. This week at the Simon Says Stamp Monday Challenge blog we have an All Creatures Great and Small theme. So you can do any type of project with an animal and/or insect. 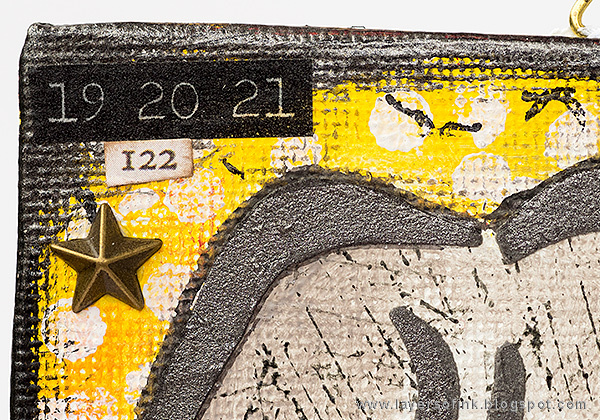 Don't miss the last project of our October guest designer Wanda Hentges. Wanda created a lovely butterfly card for you this week. I decided to go with a large creature and also one of my favorite animals, the mighty elephant. 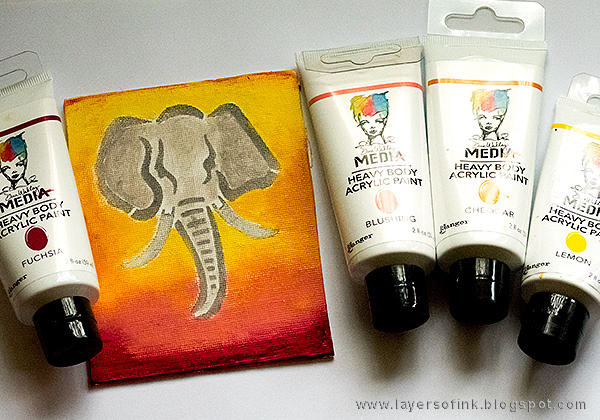 This canvas is pretty small, 4 x 5 in, and it was the perfect size for the elephant on the StencilGirl Born to be Wild Animals stencil. I went for a different color combination than I would normally have used, with a bright yellow, orange and pink background. This started out as a tutorial, but then I got in a bit of a hurry and forgot to take the remaining step photos. After coating the canvas with gesso, I started out by sponging Dina Wakley's Elephant paint, mixed with a little black to make it darker, through the stencil, and started to paint the elephant with the Elephant paint. 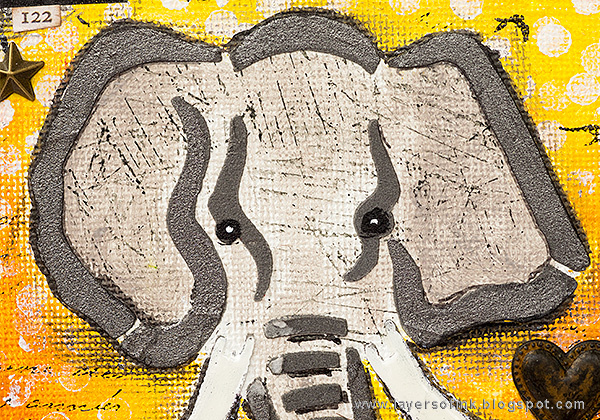 Once I had painted the elephant, I painted the background with Lemon, Cheddar, Fuchsia and a little Blushing paint. I traced the elephant on SSS Masking Paper and cut out to create both a positive and a negative mask. 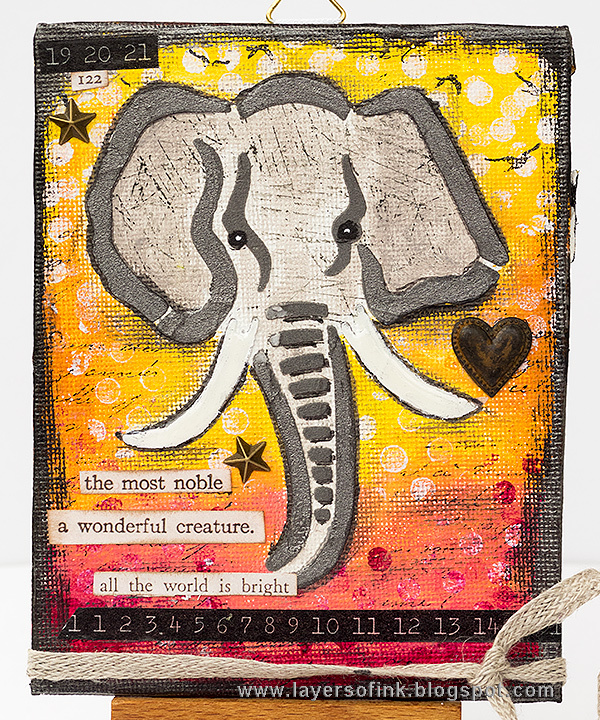 With the mask in place, I stamped the elephant with the Darkroom Door Scratches stamp, to create and elephant like texture. The I covered the elephant itself with the positive mask and stamped the background with dots using white and Fuchsia paints. Always clean your stamp immediately after using it with paint. 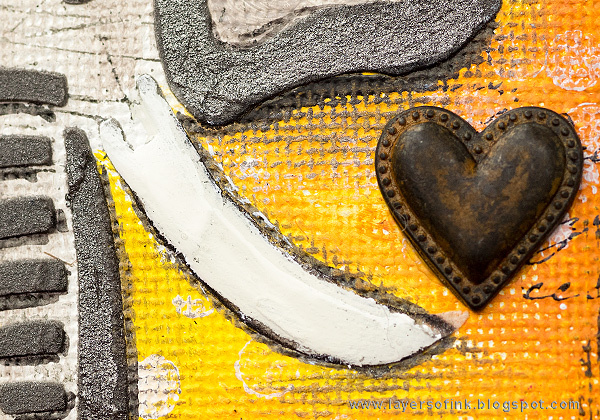 Metallic Medieval paint was mixed into texture paste and applied through the stencil, lining it up with the previous impression of the elephant. I avoided the tusks and used only white texture paste on them. When the paste was dry, I added more Medieval paint, a shadow with a Black Soot marker, white paint on the tusks and gave the elephant eyes. I added Glossy Accents to the tusks, to make them shine. The metallic heart is by Prima. Birds in flight were stamped above the elephants head and I painted the edges of the canvas black. After that, the edges were dry-brushed with the Medieval paint, which has a really nice platinum metallic look to it. There are also some Design Tape and metallic Prima stars. 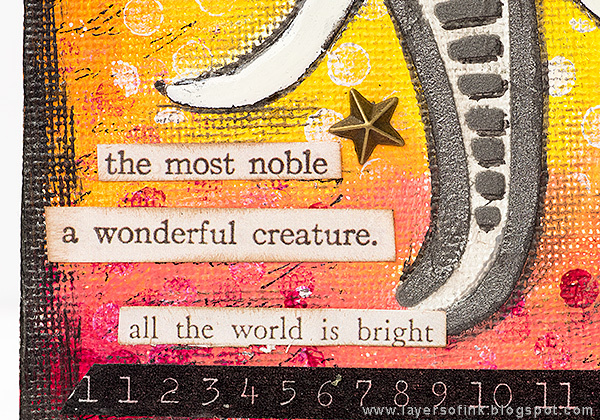 I picked three sentiments from Tim Holtz's Clipping Stickers and inked the edges. At the bottom of the canvas I added another piece of Design Tape, as well as a piece of Linen Ribbon. 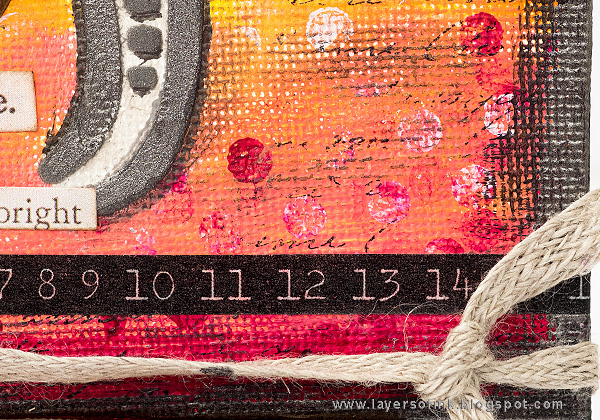 The background was also stamped with the Darkroom Door French Script Texture stamp, which you can see here and there. I hope you will join us this week in our All Creatures Great and Small challenge. As always, you have a chance to win a $50 gift voucher to do some fun shopping at Simon Says Stamp. You have until Monday 8am Ohio time. 1pm UK time, 2 pm CET to join in. Thank you for taking the time to stop by my blog today! * Please note: the links are affiliate links, for which I receive a small percentage of sales generated by the link, at no extra cost to you. I'm in love with your blended background, Anna-Karin, it's so beautiful. It's the perfect background for the elephant as it reminds me of a gorgeous African safari sunset. Beautiful! Very cool idea to go with a great creature! 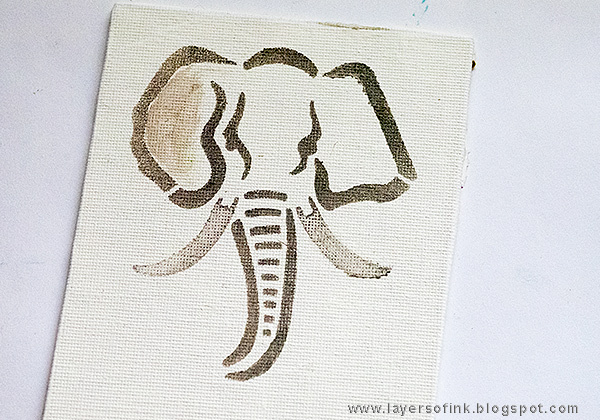 Love the simple lines of the elephant and how you made the background so vibrant. I love your elephant. Colors are so bright and pretty. Wonderful small canvas, Anna-Karin!!!! Love your elephant! !